1913 Ida Noyes Hall, now home to everything from Doc Films to Career and Placement Services, was originally in 1913 as a “Women’s Building—club house and gymnasium.” Men at the University already had recreation centers including the Reynolds Club. Reporting on President Harry Pratt Judson’s convocation address, the July Magazine expressed gratitude for LaVerne W. Noyes’s $300,000 gift for the building: “It is certain that no other single gift could meet so many needs and have been greeted by such universal approbation.” The building, which opened in 1916, was named for Ida E. S. Noyes, the donor’s late wife, who was active in several community organizations. America’s favorite pastime notwithstanding, photographer Lloyd DeGrane found that some University students spend their hours in the sun pursuing less-traditional seasonal sports. Many alumni were honored during this year’s awards ceremony, including alumni medalist Richard Atkinson, PhB’48 (see Glimpses). Here are this year’s other honorees. 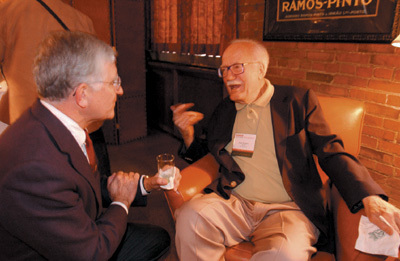 President Don Michael Randel chats with Paul Wagner, AB’38, at the faculty sherry hour during June’s Alumni Weekend (below). More than 2,200 alumni, family, and friends participated in the weekend’s activities. To see more weekend photos, go to alumnireunion.uchicago.edu.